Home » Tochta Mattress Giveaway! The Tochta mattress up for grabs was designed using memory foam and latex, a cozy combination that offers all kinds of great pressure relief. You know that feeling when you’re sinking into the mattress and it’s gently conforming to your hips and shoulders like a warm, pillowy embrace? Yeah…the people at Tochta know too. This mattress employs a four layer system of materials that work together in perfect harmony to provide firm support and luxury comfort. I don’t know about you, but four layers sounds good to me. Layers of the Tochta mattress. Oh, and did I mention that Tochta specializes in creating customized luxury beds for trailers, campers and RVs? So, if you often find yourself sleeping on the move, test your luck and enter for a chance to win! 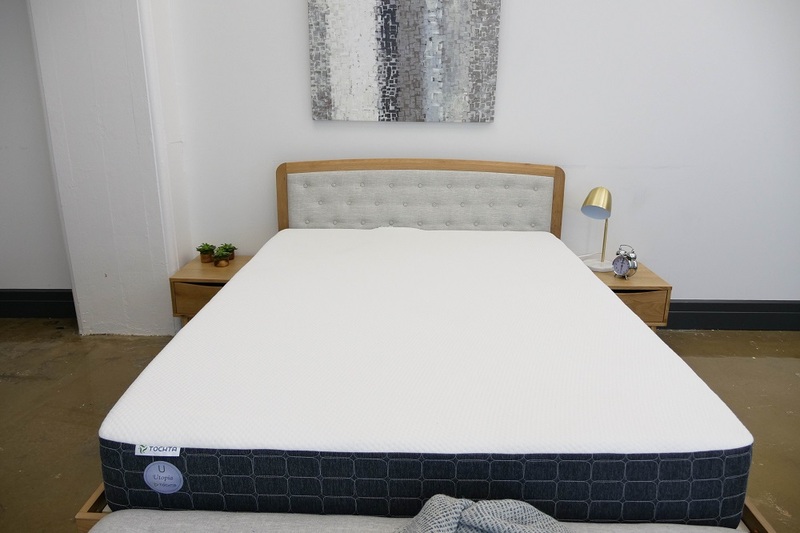 Get yourself extra pumped for this giveaway by reading the full review of this Tochta mattress! Good luck, sleepers! The New Purple mattress sounds like the better choice for me. I think the purple mattress is wonderful. Both the old and new one sound good to me! This sounds like a great mattress, I think it would be comfortable. I think the Purple mattress looks very nice! We definetly need this. Really good reviews. The new Purple sounds great. New purple but have never tried either. I see good reviews on both. I just know my mattress is not comfy and has not been since day one which was eight years ago. I can”t decide. So many choices. I love to have this! Really need a better mattress for better sleep, hope I win! This mattress looks SO comfy! I would be so grateful to receive a new mattress! They are so expensive and not in my budget right now. The Purple Mattress has to be the best Mattress ever. I would love to have one in my bedroom. I sure need a new mattress. This mattress should be ideal. Would be much better than sleeping on the one I have had for years. Need a comfy bed so badly. Please get me lucky! Either of these mattresses sounds like a dream, but if I had to choose I would go with the New Purple. The key to good health is a good night’s sleep. This mattress would mold to the shape of your body for comfort and support Good luck to all. Thanks for the opportunity to win this mattress. I’m a new purple kinda girl! This Matress here looks amazing! This looks like a great mattress! I love the memory foam/latex combo. The four layers sound great. Who doesn’t love memory foam?! This mattress looks so comfortable. This is very exciting. The mattress is very inviting and appears to be extremely comfortable. I would absolutely love to own this. This would be so great to win this for my grandson!! His mattress is so old and so hard!! I think I’d get a great night’s sleep on one of these! I would love to try this mattress. I have medical disabilities that keep me from sleeping over 2 hours a night on our mattress. I think this would be great for us. Hobby and I need a new RV mattress. Would love to win. Worried about my husbands health on our old sagging mattress. He doesn’t sleep well and this looks like he would be a heathier happier man! Fingers crossed! My wife and I would love one of these. The Tochta mattress sounds perfect for a good night’s sleep on the road. Nice review! Thanks for the giveaway! I think both Purple mattresses sound great, but I think the Purple 3 might be best suited for me. Awesome mattress! I’d love to try it. I would LOVE to win this mattress !! It looks like it’s perfect for me! I have such an old mattress that it has a small dent in it and therefore I don’t get any sleep anymore! This would be a MIRACLE! It does look a bit soft, but I’m a side sleeper. I’d love to try this! Thanks for the great review! Would love to try this mattress! Due to an injury, I have an extremely hard time sleeping and anything that would help to obtaining longer sleep periods would be more than welcomed. This looks AWESOME!!!! You have taught me so much over the years about mattresses, and I thank you for that. As a strict side sleeper this mattress sounds wonderful! I often have shoulder pain from my current mattress. What’s the average bill of materials cost for these foam-based mattresses? This would be a lifesaver for me. I suffer from multiple sclerosis and they are our nights many nights in great succession that I get no sleep or very little. It is painful and it affects my mental health as well and I get very depressed. I would love to have new mattress and I would shout it from the rooftop that this is the best mattress around. Thank you for the opportunity. God bless. A good night sleep is very important to all of us, and it is a must to have a comfortable mattress to just melt into every night. I NEED A NEW ONE AS MY TEMPEDIC WILL BE 8 YEARS OLD. ARE THESE MATTRESSES HEAVY FOR A KING SIZE? Looks good, sounds good, Can’t wait to sleep on it. This mattress would be SO GREAT on my fibromyalgia sore spots, and for my acid reflux! I would love this mattress. This mattress sounds amazing!! There really were no cons! Looks a product who wouldn’t want to try one?! I am definitely a Purple mattress person! Sounds like a great mattress. I love the color purple so winning would be great for me! I will not even be choosey, either one is perfect. Thank you so much for the chance you have given me. I would love to win a new mattress. I really like the purple mattresses. My current mattress has me waking up stiff and hurts my back. I’m a New Purple Mattress person. But I really like the Tochta Utopia Mattress it has so much to offer. I am getting up in age, a nice mattress would help me get a complete nights sleep. Thanks and good luck to all. This mattress looks amazing! My bad back wants one lol Thanks for the chance and good luck to all! Would love 2 win this. Looks so cozy. Thanks for this chance. I have read great reviews on the purple mattress. I think the new purple would be the one for me. Support coils seems like a great idea! I absolutely love the purple mattresses. I think their highly creative and seem to be way more comfortable then a regular mattress. I would be a new purple kind of girl. I’m an original purple person. But I really like the Tochta Utopia Mattress it has so much to offer. Perfect timing for a new, better mattress! I’ve never really thought about RVs and campers having different needs for beds. I guess you do learn something new everyday! Can’t wait to win this King Size Mattress !!! I need a good restful, relaxing nites sleep. Please draw my name. Thanks for the contest. Good luck everyone..
My husband and I could really use a new mattress. We have never owned a brand new one ever, we never could afford it. Thank you for the chance. If you can’t sleep at night, it’s because you’re awake in someones dream. I really need a new mattress. Mine has big lumps. I can’t believe how much you can customize the size on these mattresses! I would love a regular King for myself because the construction sounds amazing but this would make for the perfect solution in my guest room! I want to be able to fit a queen bed but the perfect space for it is about a foot too small. If I could customize a queen mattress with a 2 by 1 foot corner notch, I could finally put my dream room together!! My back will thank you if I win this mattress. I love the purple mattress and not just because purple is my favorite color xD They made a mattress “sciencey” to maximize benefits :D I’m a “new purple person” hehe! This mattress company sounds awesome! I can’t believe the amount of customizability, I would use them in a heartbeat if I needed to put a mattress in an RV or tiny house. I think I like their latex mattress the best, I tend to stomach sleep. I’m a side sleeper. My body hurts. I need a new mattress. I’m a new purple person. This mattress seems amazing! This mattress looks incredibly comfortable. Looks & sounds like an absolutely wonderful mattress for side-sleepers like me & the hubby! It would be so wonderful to keep cool during the night, and get a GREAT night’s sleep!!! I would love to try the Purple Mattress. I’m in desperate need of a new mattress! I am not going to give you a sob story of my life and what I am going through. I am just going to tell you I really need a new mattress and hope that the computer picks me. Thank you for the opportunity and Enjoy your week!! I think the Purple mattress looks comfy and my kind of mattress.I am a New Purple person. I would love to become a purple person! They both sound amazing but I think I’d be an Original Purple person! I think I’m a New Purple Mattress kinda girl. It looks so comfy. My mattress is over 29 years old soid be beyond thrilled & grateful to win this amazing giveaway!!! I would love a new mattress. My boyfriend and i have been sleeping on our mattress for 7 years . Its time for a new one. I haven’t tried a Purple mattress before but this looks like a comfortable one. I’m a side sleeper and love memory foam, so this would be a great mattress for me to sleep on. 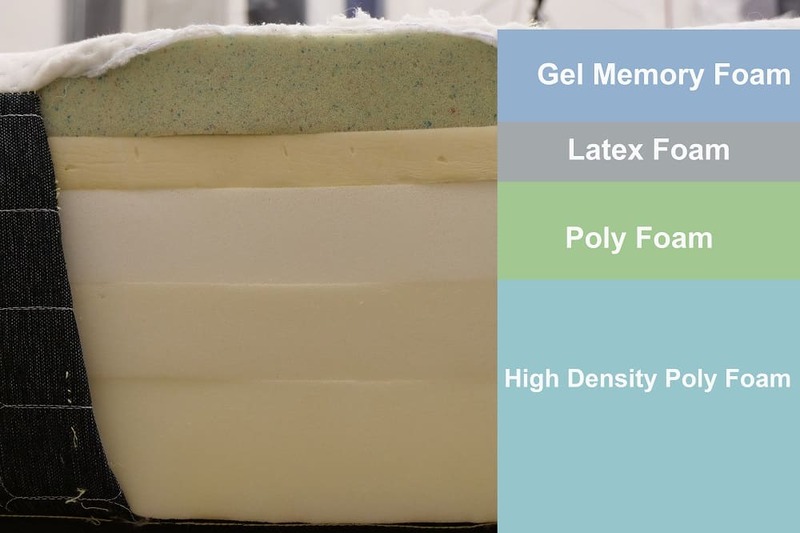 I love all the layers of foam in the Tochta mattress. I would love to win this. I’m a new kind of purple person. I would love this mattress! I like the Purple adds. I would love to have a new mattress. The purple sounds great but I’m more of an original mattress girl. Any mattress other than what we have would be amazing! I love this review. I would like to go Purple soon. OMG can you imagine winning this bed? Or the money to buy it??? I am a new purple kind of person. My friend actually has one, and she highly recommends one for me. I have hypersomnia so it is important for me to have the best mattress. I am a New Purple kind of person for sure after reading this review and watching the YouTube video! This mattress sounds amazing and I would be so thrilled to win this as my mattress is many years old and starting to hurt my back. Thank you for the chance! This would help this zebras pain greatly. Also, would be a perfect end to Ehlers-Danlos Syndrome awareness month. Maybe a new mattress would help my back problems. Woops, forgot to say – never slept on a purple mattress and I have read reviews that were not favorable after a years sleeping. Thanks for holding this sweepstake! I need pressure relief in my mattress and this looks like the one that would work the best. I would like to try it for a few weeks. Purple would fit the bill, but so would so many of the new mattresses being offered in this manner. We need a new mattress! This looks like a great mattress for a side sleeper like me! I think the Purple mattress is my kind of mattress. I am a New Purple kind of person. I would love to win a new mattress ! Maybe a NEW purple because I need a NEW mattress! My husband passed away 7 years ago. I have not had a good nights rest since then; one because he’s gone, and two because my mattress has a hump in the middle from us sleeping on each side of the bed when he was alive. And, being a widow on Soc. Sec., I cannot afford another mattress. I could really use a new mattress I got kicked out of my apartment and I am living with my dad and it is really hard to pay bills and save at the same time! Especially when you have to start at the bottom and work up all over. Would love to try this mattress out! I would love to have this bed lost everything from the hurricane in Houston, Texas. I think the New Purple Mattress is the one I have been waiting to find! This mattress seems to be very well made and thought out. Would love to win, I have health problems and a good mattress can make all the difference! Wow! My eyes are already getting heavy thinking about climbing up on that glorious bed and taking a nap. I can visually picture myself getting all comfy and cozy and after listening to the video and hearing about the comfort and seeing all those different types of foam on the Tochta Mattress, I have no doubt that I would experience the best night of sleep I’ve had since I was a chikd. I would be estatic and I am already falling in love with this Tochta Mattress if I were lucky enough to win this beauty! Nitey nitey yaw!! This is one sweet mattress! Sure would love to get comfy on this mattress. I really need this matress. I would love to win. Never in my lifehave I won anything. I am thinking I would get a purple night’s sleep. It looks amazingly comfy. I think they look and sound amazing!! I would love to sleep on this matress. Thank for the free entry. A good mattress is worth more than any lottery can ever give you. It’s priceless! I love this mattress. Looks super comfortable. Thanks for the wonderful opportunity. I would love a mattress like this. I need one badly. I have a 30 year old mattress and my back hurts at night. BOY DO I NEED A NEW MATTRESS!!! I would really like to try this mattress. I would love to try this!. With the 4 types of layers it looks like it would be great to try. I’m in need of a new mattress but not just any old mattress will do. I am really liking the specifics on this mattress. I do like the color purple.. I think it is Great! Just what I need! Yes, I am a Purple mattress kind of person! Im both. This sounds amazing. My bed is 15 yrs old and with a bad back I know it’s time to invest. Thank you for the wonderful review. I think the Tochta mattress looks like a fine quality mattress. I wouldn’t know for sure unless I gave it a test drive, but it does look like they have taken extra measures for comfort and quality. Thanks! Looks very comfortable. Thank you again for the opportunity to win this. I desperately need a foam, king size mattress please. Awesome giveaway.. thank you for your generosity. I really love this mattress. I’m a new purple, I love it! He’s a retired us veteran this seved his country for many years. He’s a great man and provider to his family. I hope I can win this for him and give back least something that can be beneficial for him. He has a bad back and this bed would help ease his back…. Thank u hope I can win. Wow I would sure love to be a purple mattress person!! Just what I need to have the best sleep ever!! I think the Purple Mattress is amazing and I would love to sleep on it every night! I think I’m a new Purple kind of person. I’d love to try them both out, to be honest! Love the way this site reviews these mattresses! Need a new comfy bed for a restful sleep. Still trying for a win for a mattress for my son! It all sounds so wonderful! I would love a bed like this. Thank You for the review of the Tochta Utopia Mattress. I have been shopping around for a while now for a new mattress. I’m a new purple person, but the old purple is very nice too. I believe this is a mattress that would actually help my back. I tend to wake up n pain and I think this would help me not wake up in pain. Thank you for the chance. Having Fibromyalgia,sleep is the best thing that I can do to be able to function better the next day.So this would be perfect,Thanks. There is definitely a lot of padding in the mattress! Would like to hear more from the Tochta Mattress. It sounds heavenly to sleep on. to get a new Queen size bed. I definitely could use a new bed!! Ours is falling apart on us after spending $1,800 on it from art Van😒 we would be so thrilled to toss this one out lol. This mattress looks great! I need a new mattress. Thanks for this opportunity! Looks like a comfortable, quality product. I like the fact the Tochta Mattress could be customized for trailers, campers & RVs. Omg. I would love to lay my 61 year old body down on this lovely bed. Omg I love the Purple mattress pick me, pick me fingers crossed! Wow sounds like this mattress was designed just for me. Loving this Giveaway from #Tochta GL everyone! This certainly looks comfortable. I would love to try it. It looks cozy, a new purple. Pretty amazing the way a person can get a custom fit & comfortable mattress for any size space. I think the Purple mattress is a great idea! I think I’m more of a Purple original kind of person. I am so excited to learn about this mattress and the benefits of it being customized for campers,trailers etc. Mattresses are so hard to find the right comfort for your needs. I myself have yet to come by the perfect mattress for me. I really need a new mattress. My current one is over 20 years old! I like the new purple mattress. This is THE mattress of my dreams, literally. I need it desperately for health reasons; I have MS and my old mattress is making it worse. I want it for personal reasons. I will be so grateful! Thanks you for making such a wonderful mattress. Amazing giveaway. This mattress looks great! Moving soon and could use a comfy amazing mattress! The trchnology sounds like a dream. Boy could I use this. Our mattress is over 10 years old. I am so in the need to try this mattress of yours, thank you! Haven’t been sleeping comfortably for years and that makes for lousy mornings. I have never had a new mattress. It would be wonderful to win one! I am definitely buying a purple original when we get our Purple mattress. I have to save that I enjoy your mattress reviews thoroughly and they have helped me greatly when I pick my next mattress next year. Sounds heavenly for strictly side sleepers with back issues/injury. I’d love to feel this one as I really prefer a softer mattress! This bed looks like it would sleep like a dream. I wish I could touch it. Better would be to lie in it. I would love to win this mattress. I need a new mattress so bad. But I’m on a fixed income and will never be able to afford one. Looks like a mattress that comforts your entire body to promote sleep. #sponsored #giveaway ❤️LOVE TO WIN! !❤️ thanks for opportunity, Since my mattress is more than 25 years old and our 50th Anniversary is June 29th, this would be wonderful to win!! Oh man, looks so comfy! I bet this mattress would do wonders for my back! I would love to win a new purple mattress! Your analysis tools (motion transfer graph, pressure distribution, etc) are so neat. It objectifies the whole mattress shopping experience. Thank you. Well done. Memory Foam and Latex is the most desirable features for a mattress. This mattress sounds great! I’m a side sleeper, so I would love to get this one. Fingers crossed! I need a bed that makes me feel like I’m floating…2 much pain with my achy body. 2 neck surgeries including. fusion & lumbar fusion. Never took pain away…but greatful not paralyzed. My bed feel hard no matter how many cushy things I put on mattress. Oh! If you only knew how terribly my husband and I need a new mattress..which are we? We are whatever will bring a new mattress to our home..Thank you for being so very generous! The mattress seems like a dream to sleep on. I believe I am a new purple kinda gal! Sounds like a really comfortable mattress! I think they both look comfortable. Oooh I NEED a new mattress. Would love to win a Tochta matress! I have never had the pleasure of trying the purple mattress but would absolutely love to. It sounds amazing! With all the commercials i.v been seeing , YouTube videos and adds, purple mattress sounds amazing. To good to be true? Reviews say awesome bed! I would love a new Purple mattress. Purple mattresses are wonderful! It’s as if the manufacturer isn’t sure which kind of foam actually works best on a bed.